Some of the early reports on faulty Samsung Galaxy Note7 smartphones that caused burns and property damage have been invalidated, significantly reducing the number of incidents. Data released today by the U.S. Consumer Product Safety Commission (CPSC) shows that Samsung had received 13 reports of burns and 47 reports of property damage in the U.S. since Note7s went on sale in August. By comparison, a CPSC report from Sept. 15 showed Samsung reported 26 reports of burns and 55 reports of property damage until that date. That earlier report was taken down from the CPSC website Thursday morning, but the Sept. 15 burn and damage numbers were widely reported at the time. A CPSC spokeswoman said by phone on Thursday that "some of the incidents included in the original announcement were not valid." She didn't explain whether the CPSC had invalidated the claims or had relied on Samsung to report they had been invalidated. She couldn't explain why the earlier report had been removed from the CPSC site. Overall, the CPSC said on Sept. 15 that it had received 92 reports from Samsung of batteries overheating. That number was increased to 96 in the updated report and included 23 new reports of batteries overheating since the Sept. 15 recall announcement. The CPSC didn't say whether any of the 23 new reports involved the Note7 replacement devices or were from the original devices. Samsung started shipping replacement devices using different batteries after the CPSC's official recall on Sept. 15. Samsung has not commented on the change in numbers. 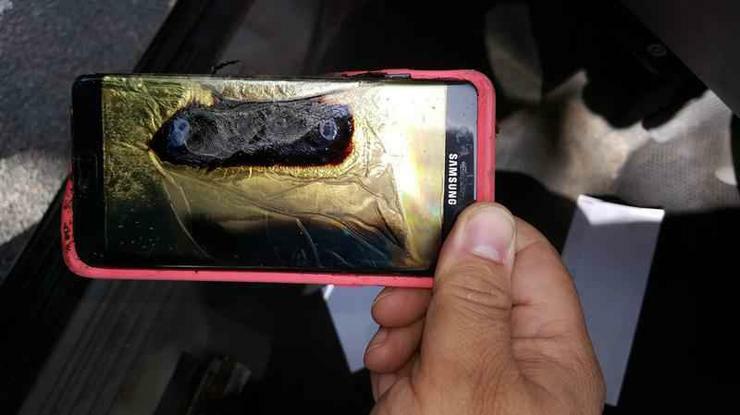 Both Samsung and the CPSC have said they are investigating the causes of the overheating, smoke and fires attributed to both original and replacement Note7s, but the results of those investigations have not been made public. Samsung could face penalties for fabricating accident reports to the CPSC, although no such claims have been reported. The CPSC routinely relies on manufacturers -- as well as consumers -- to report problems with products before conducting an investigation. Businesses and consumers can report an unsafe product on the CPSC's website. "There are penalties for lying, so I doubt the numbers are not truthful, to the extent that Samsung knows," said Jack Gold, an analyst at J.Gold Associates. Gold said the overall number of Note7 accidents is small, considering that Samsung originally said it was recalling 2.5 million Note7s globally on Sept. 2. "Nearly all devices with lithium-ion batteries have some level of battery failure," he added. In a separate development, a battery inside a Samsung S7 Active smartphone swelled up and broke the phone while charging, according to a report in BGR. Gold said the Active device in the BGR report is "only peripherally connected to the Note7" since both phones have lithium-ion batteries but likely have different battery designs. "A device failure here or there does not mean the basic designs are flawed or that there should be a recall," he added. "All chemical, mechanical and electronic devices have some level of failure, and that's why manufacturers offer warranties."